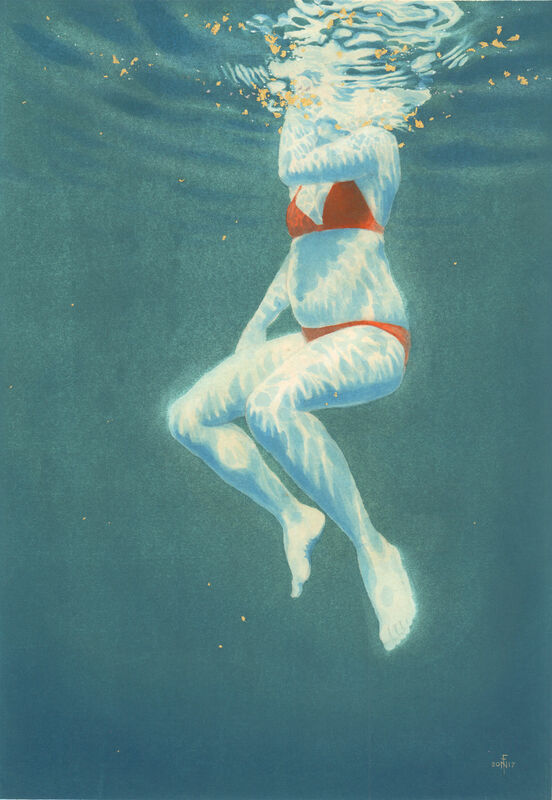 New painting – 9 x 13 inches, in gouache / watercolour and gold leaf. 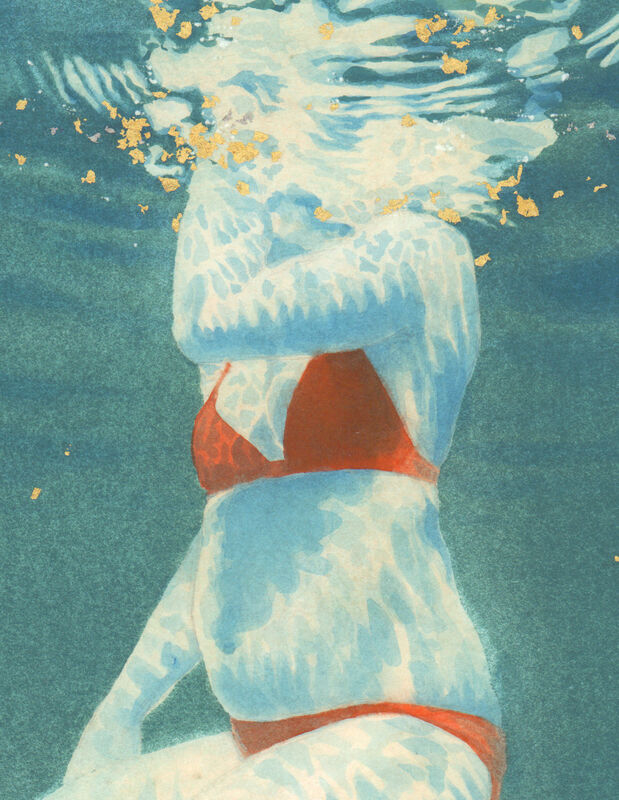 I’ve been largely avoiding the issue of reflections on the underside of the water surface for long enough, because they are so complex. This is the first of several where I’ve actually tackled them properly. 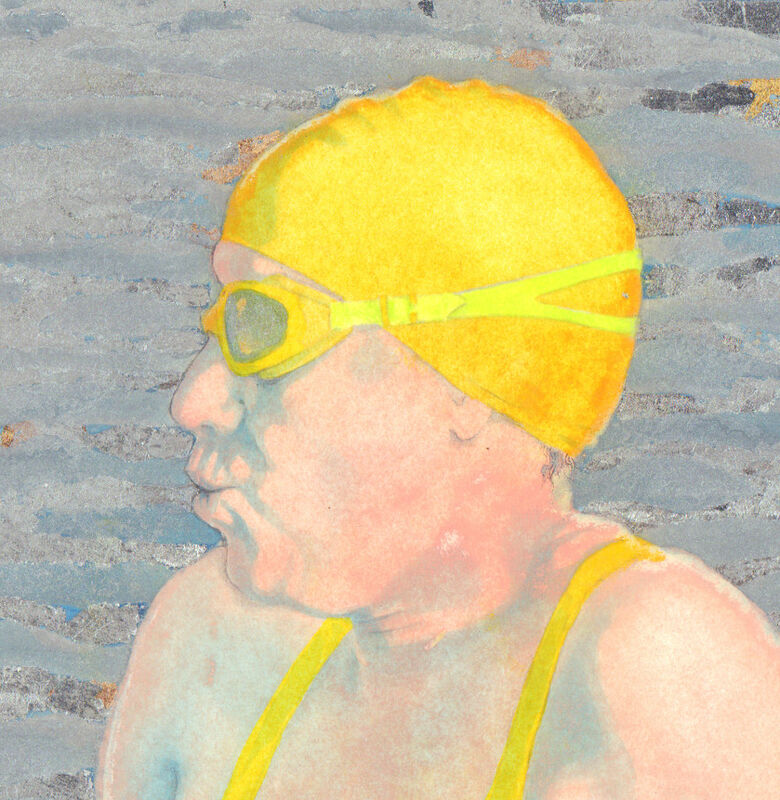 I’m not trying to get a photographic likeness but aiming for something between that and just a few suggestive splodges of colour. 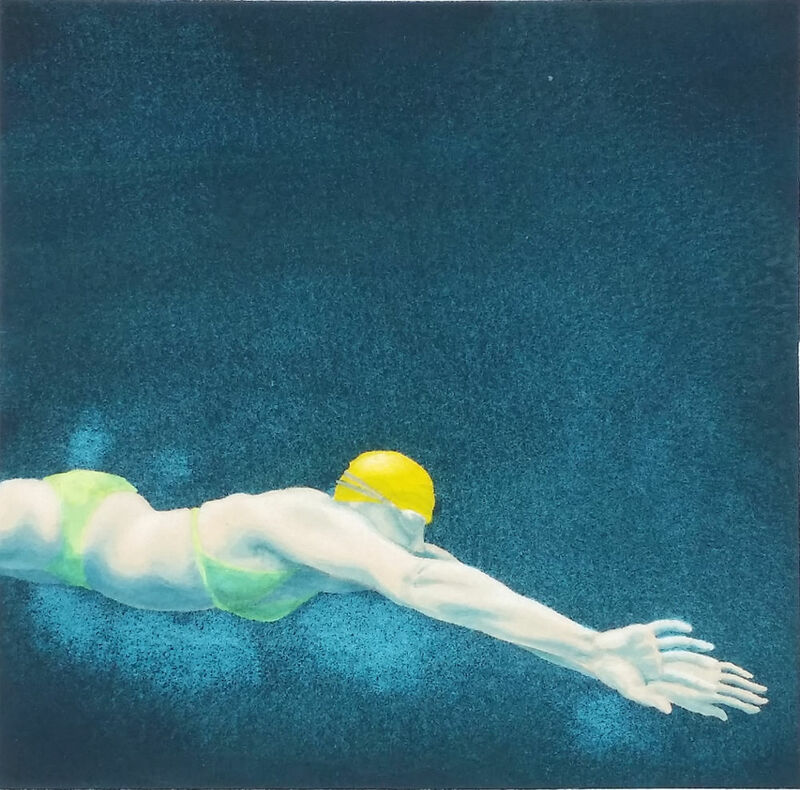 This entry was posted in Metal leaf, Paint, swimming and tagged art, gold leaf on paper, gouache, painting, reflections, swimmer, underwater swimmer, watercolour on June 25, 2017 by Nancy Farmer. 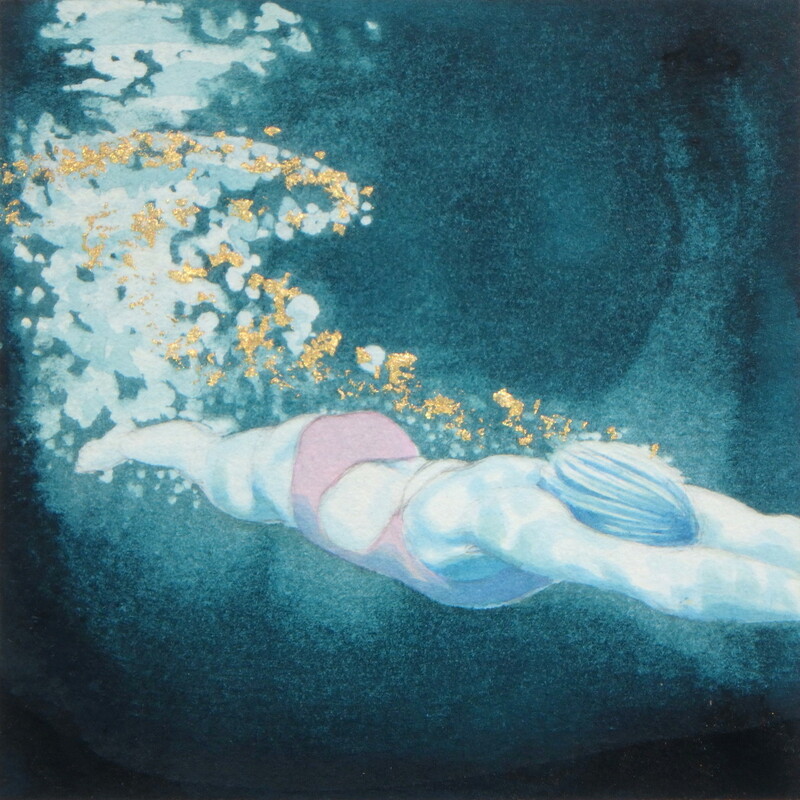 Three have gone to an exhibition, two have been sold, the rest are all there for you to browse should you wish. Here are a few I haven’t posted on this blog yet. 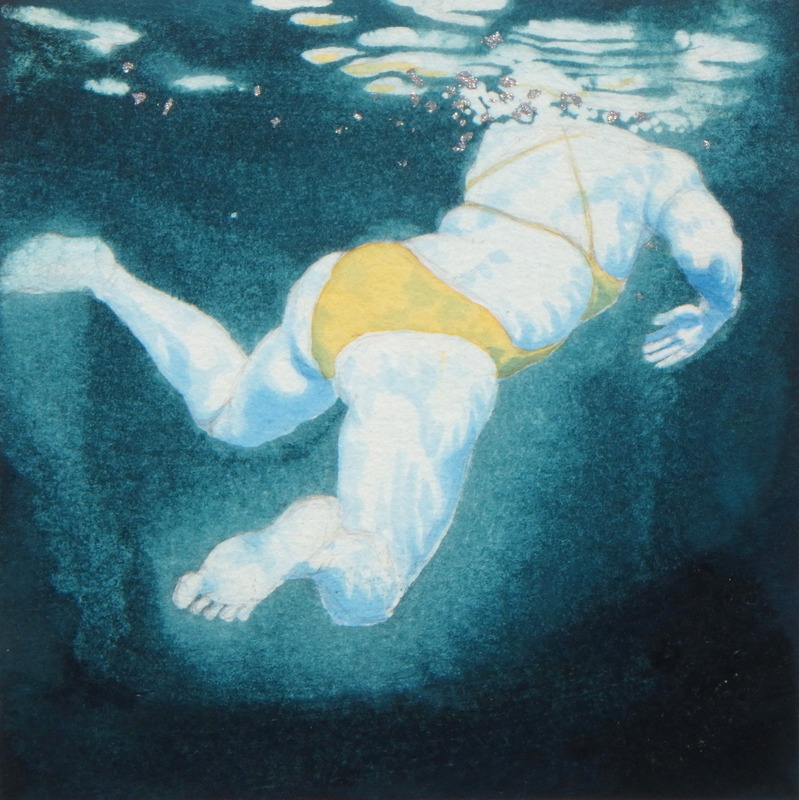 Most of them are 4 inches square – a size that I found challenging before I painted all these: I’ve had a bit of practice now. The last ones three are about 5.5 inches square. And most of them have shimmery bits of metal leaf on them – gold, palladium or aluminium, which gives the ‘bubbles’ an extra dimension. 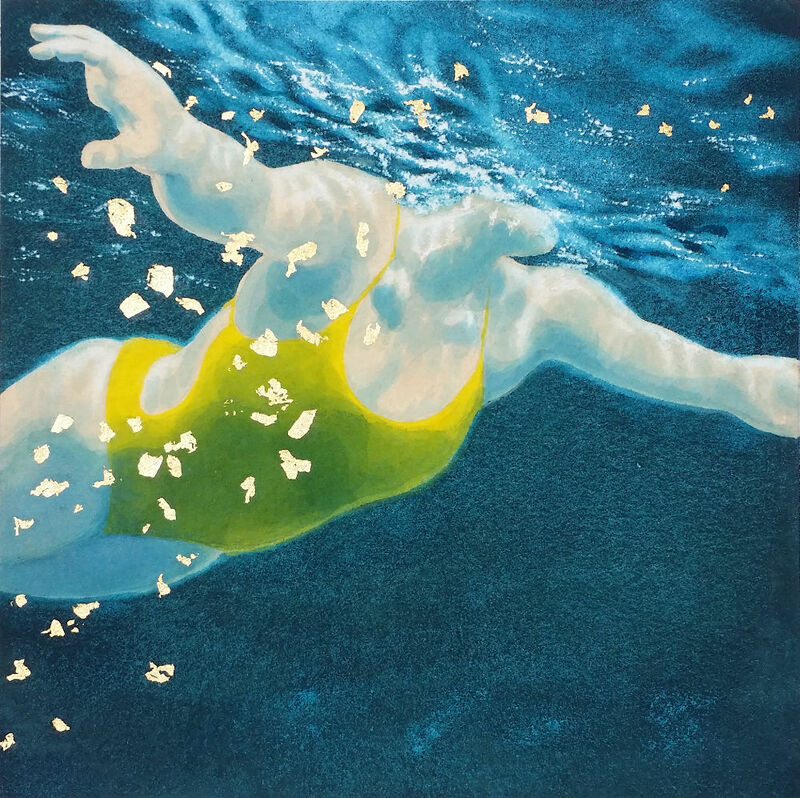 This entry was posted in Art for sale, Metal leaf, Paint, swimming and tagged aluminium leaf, Art for sale, gold leaf, illustration, Metal leaf, open water swimming, painting, palladium leaf, underwater on June 11, 2017 by Nancy Farmer. 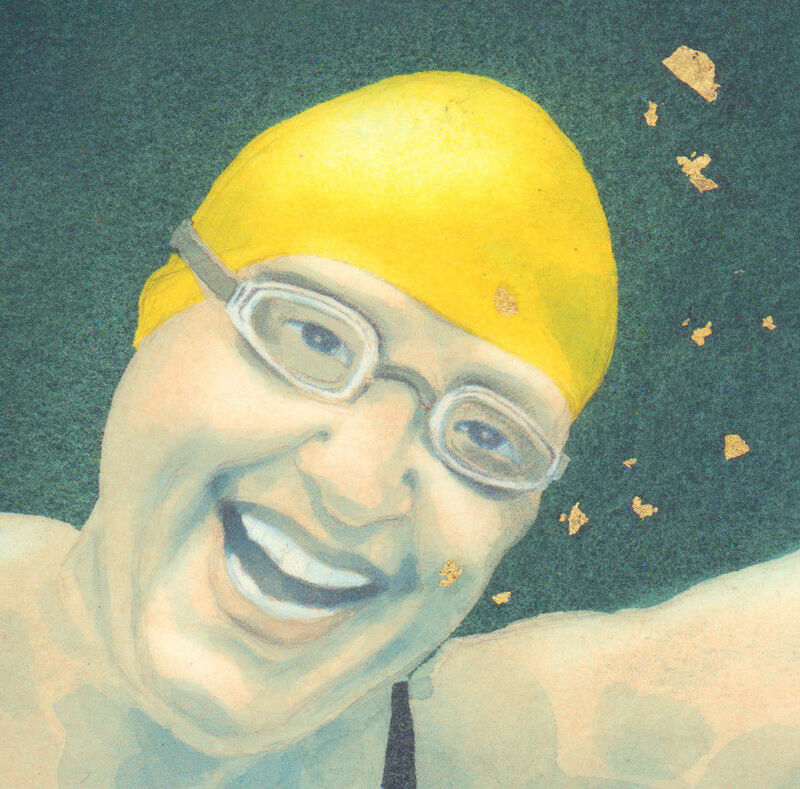 Commissioned portrait that I painted last week – an underwater swimmer – Hilary – with gold leaf fragments for bubbles. 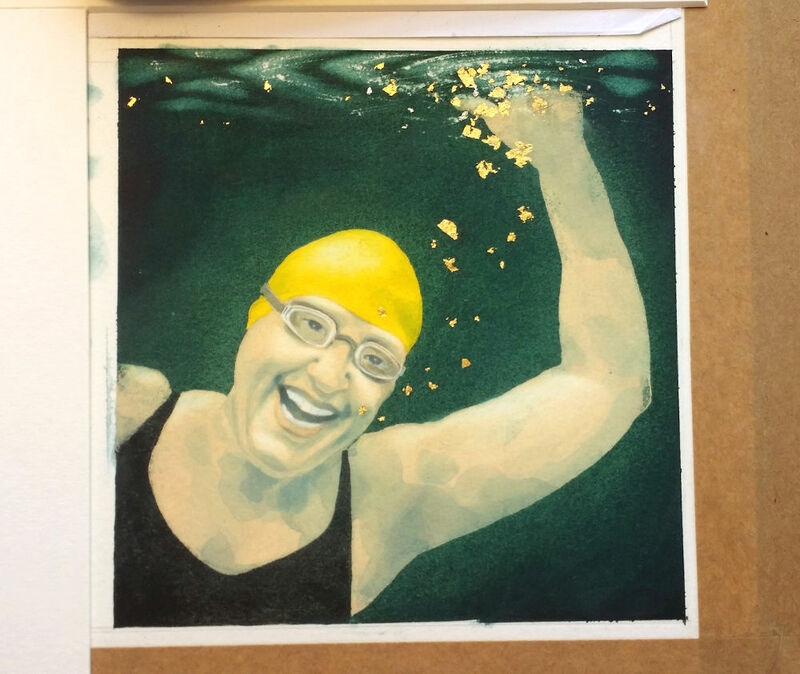 Unlike most of the swimming commissions so far, this is in paint, not a digital creation. 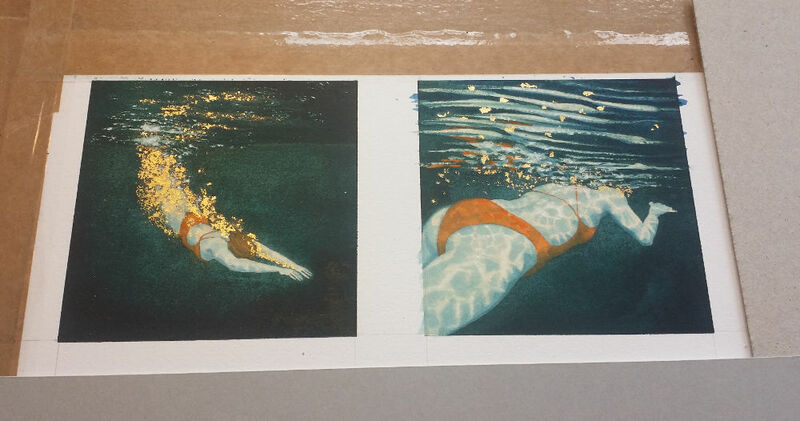 The gold leaf doesn’t show up very well on the scanner, so I’ve photographed it as well, which catches the light on the gold better. 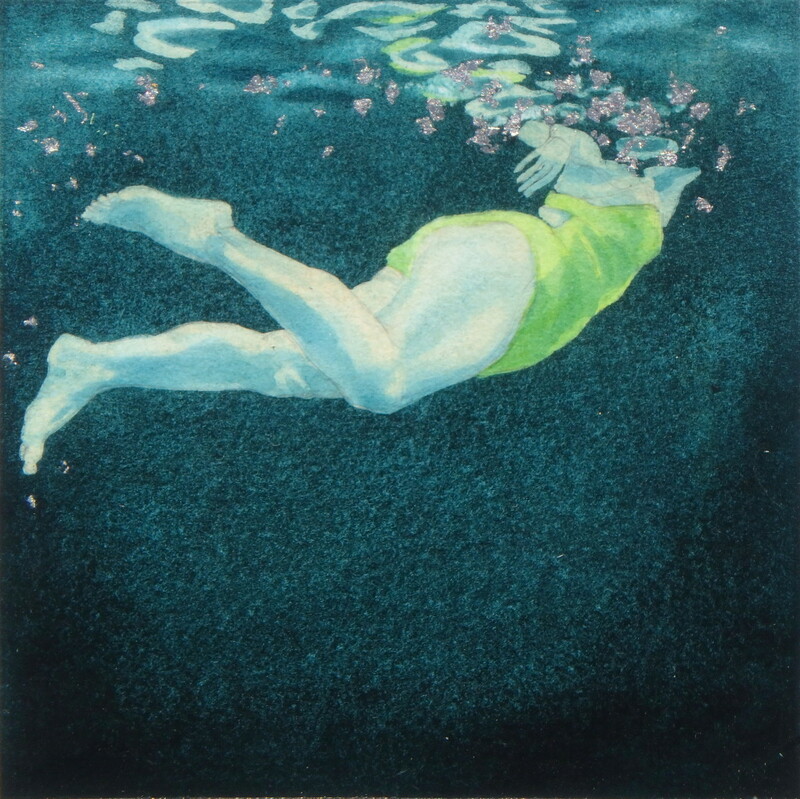 The size is about 5.5 inches square. 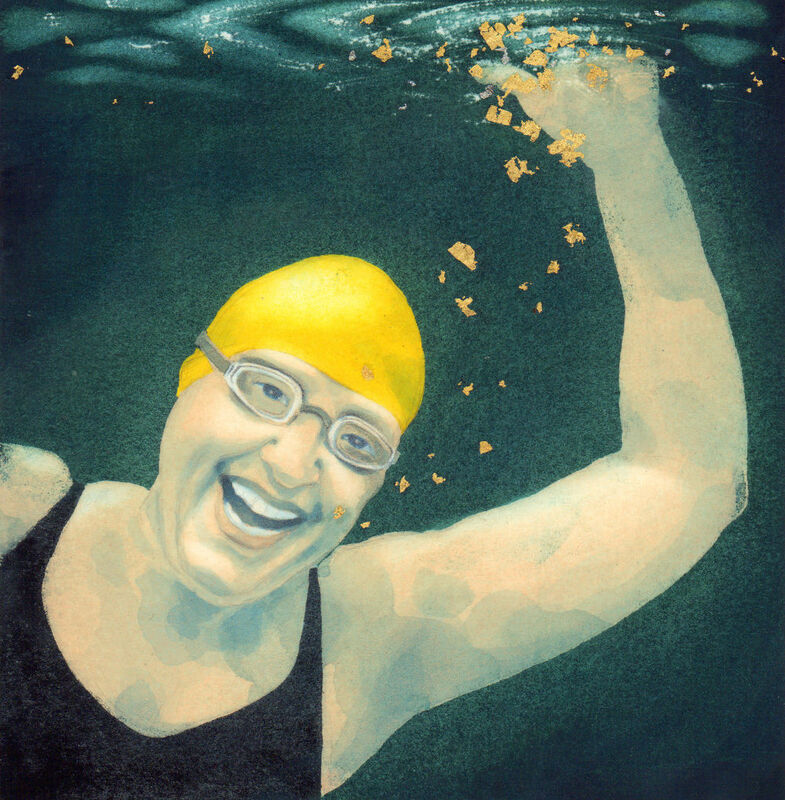 This entry was posted in commissions, Metal leaf, Paint, Portraits and tagged commission, gold leaf, gold leaf on paper, gouache, painting, portrait, swimmer on May 28, 2017 by Nancy Farmer. 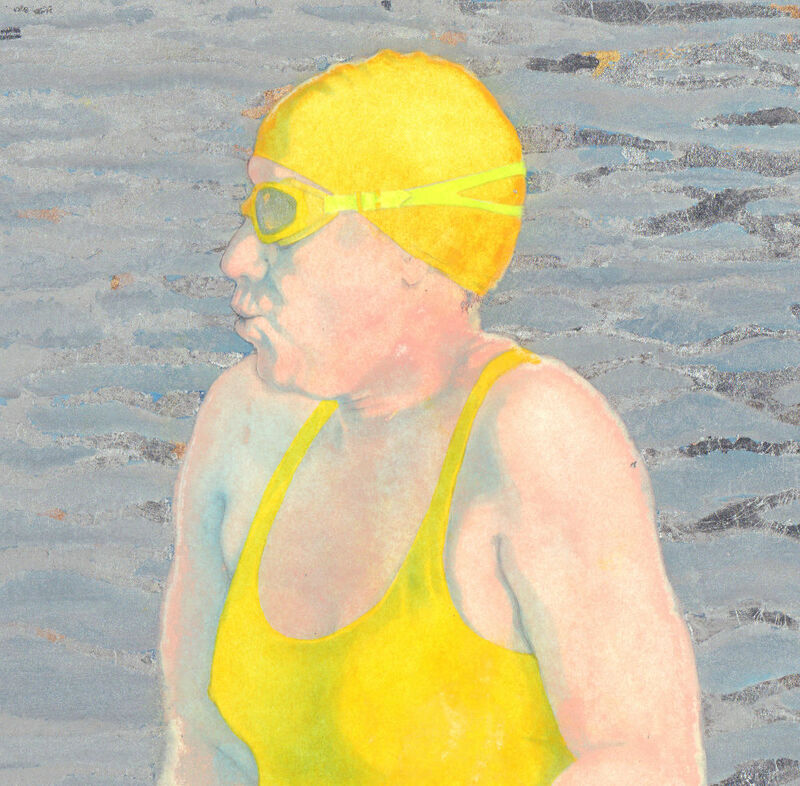 Feeling that there were some interesting developments in the last lot, I am continuing with mini paintings of swimmers, mostly incorporating metal leaf (Gold / Palladium or Aluminium). 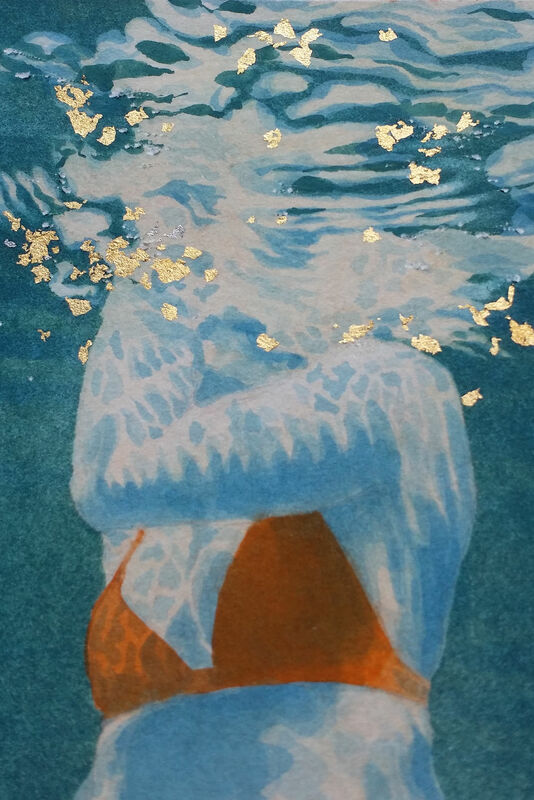 Here’s a quick work in progress… first shred your gold leaf (I used a pointy steel tool to hold the gold leaf down with, and shredded it with the tip of a scalpel.). 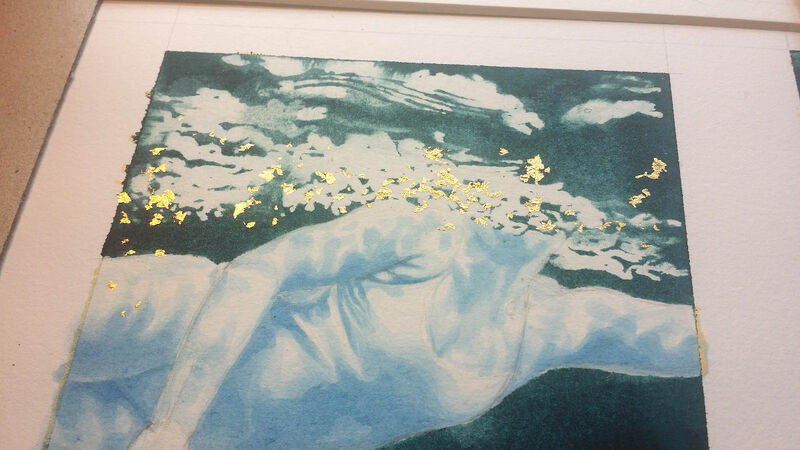 Next, apply, fragment by tiny fragment, to the painting. Fortunately I have the sort of patience for this kind of thing. 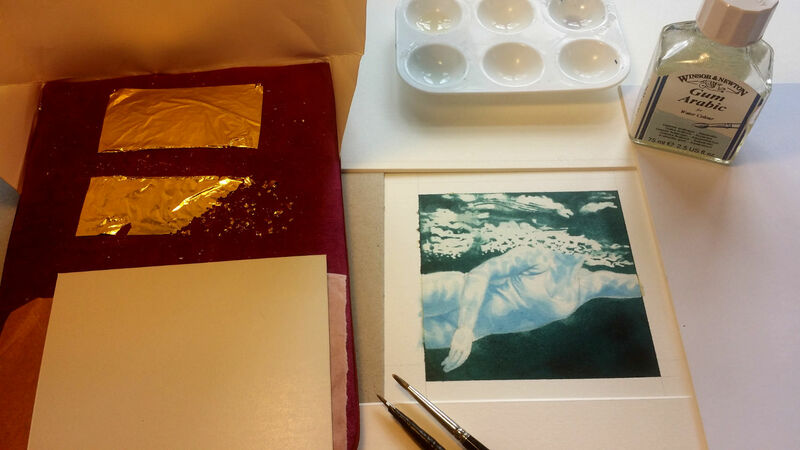 This is not the normal way gilding is done… by trial and error I’ve found what works well is picking up a gold fragment on the tip of a damp paint, applying the tiniest dab of dilute Gum Arabic to the paper, and then laying the fragment on the paper and smoothing it down with the damp brush. I’ve also found the easiest way to do this is to work with a brush in each hand. 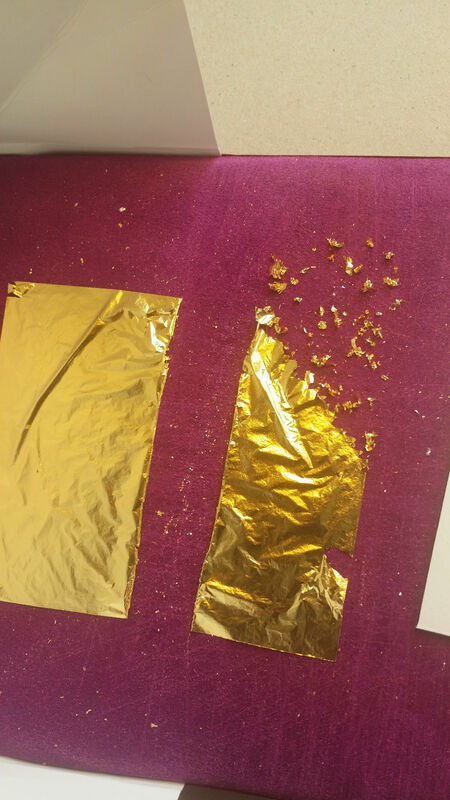 This tends to minimise the number of times that I either loose track of where I have put the glue as I take my eyes off it, or pick up the gold leaf with the gluey brush, not the just damp one. It also speeds up the process quite a bit. 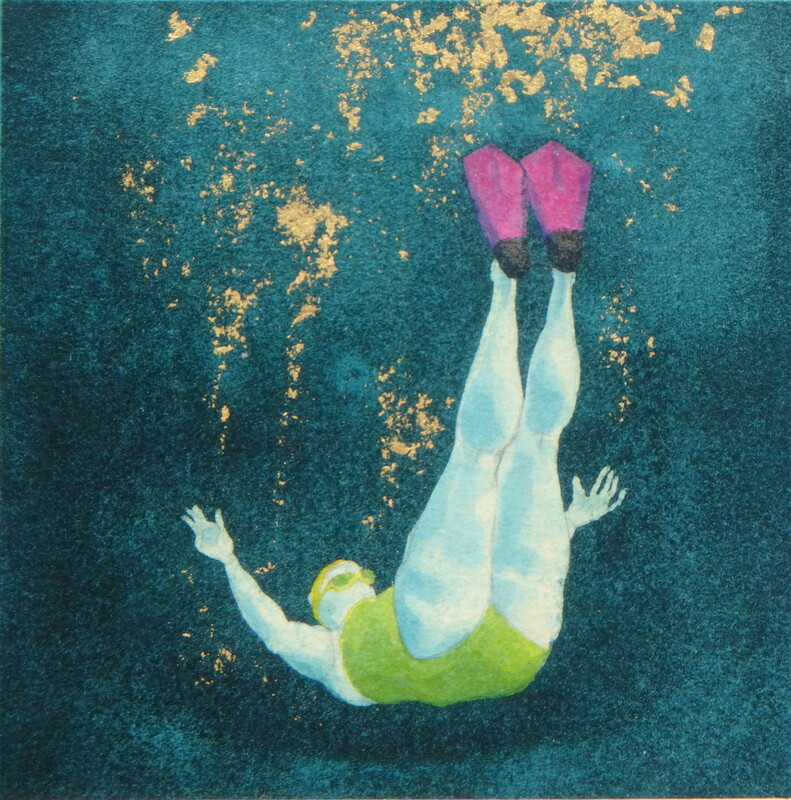 This entry was posted in Metal leaf, Paint, swimming and tagged art, gilding, gold leaf, gold leaf on paper, mini paintings, painting, swimmers, watercolour on April 29, 2017 by Nancy Farmer. 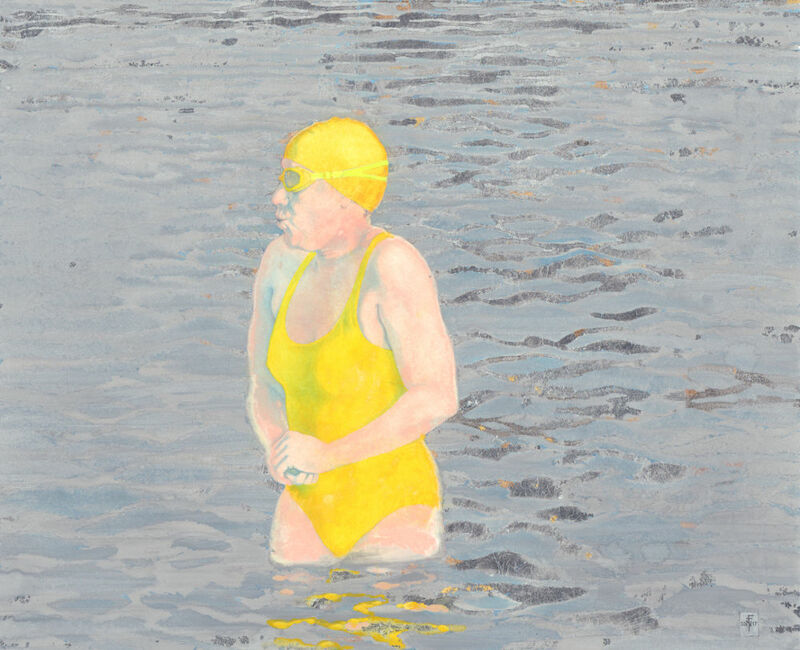 I have been working on A LOT some small paintings at once – for me – considering I usually have only one painting at a time on the go. 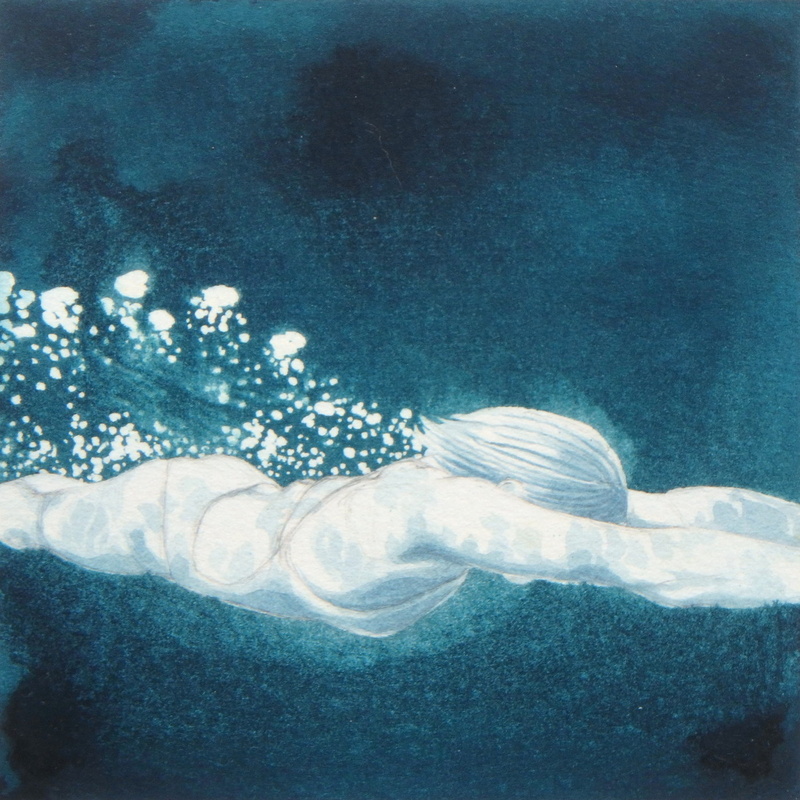 This is partly because I am painting small scale for a particular exhibition, and partly because I thought it would be an opportunity to experiment a bit more – swimmers in actual paint is a new thing for me, and the addition of metal leaf is something I have been trying to find a place for in my recent paintings as well, so it was a chance to try out several variations and see where it went without being too intimidated by a massive investment of time if I messed it all up. The size is about 4 inches square. 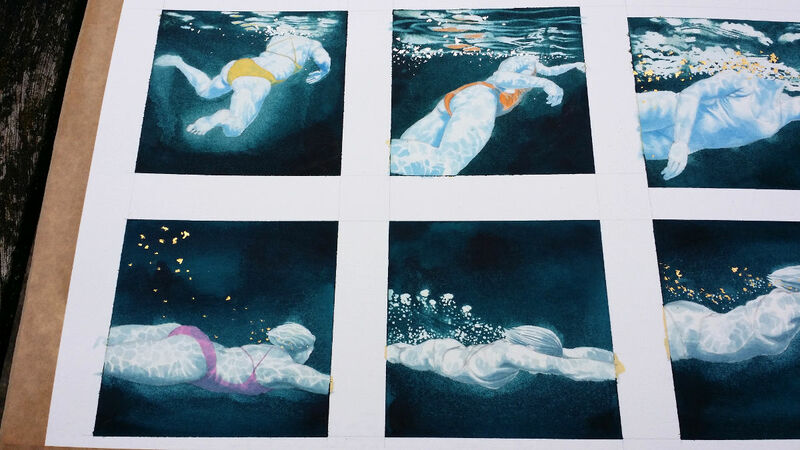 The media are gouache, watercolour, metal leaf in gold, palladium and aluminium, and occasionally attacking the paintwork with a scalpel, which is always fun. …usually where I want it to. More paint, metal leaf etc. And the plan chest surface is full as well. Cats are banned from this room till I clear up. 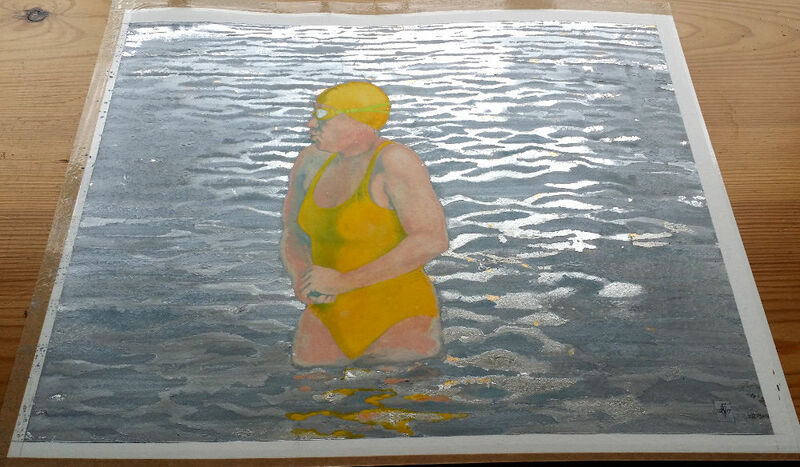 This entry was posted in Metal leaf, Paint, swimming and tagged aluminium leaf, gold leaf, gold leaf on paper, gouache, painting, palladium leaf, swimmers, watercolour, work-in-progress on April 14, 2017 by Nancy Farmer.